Company Overview - 24 Hours Packaging Technology (Shenzhen) Co., Ltd.
As a leading packaging box manufacturer and exporter in China. 24 hours printing have all-around capabilities include research and design, mold development, box production and export trading. The products covers more than 5000 specifications in 8 series: deluxe watch boxes, jewelry boxes, cosmetic boxes, medal boxes, perfume boxes and various kinds of craft gift boxes. And all materials are selected high-quality materials from local or overseas, such as delicate wrapping paper, leather/PU, PVC, flannel, cardboard, etc. After years of development in the industry, focused on unique design and fashion elements in both material selection and products design, the products can be customized with customers' logo, or their specified materials and colors. And supporting samples or drawings to proofing. The company has set up R&D department, with the ability to quick developing new products, various kinds of gift boxes can be tailor-made. We work on offering our customers with the most efficient and sincere service and support. With strict quality control process and continuous innovation, whether it is mass machine production or manual, we implement standardized operations. The staff are always send out to training classes to improve operation skills and management ability. 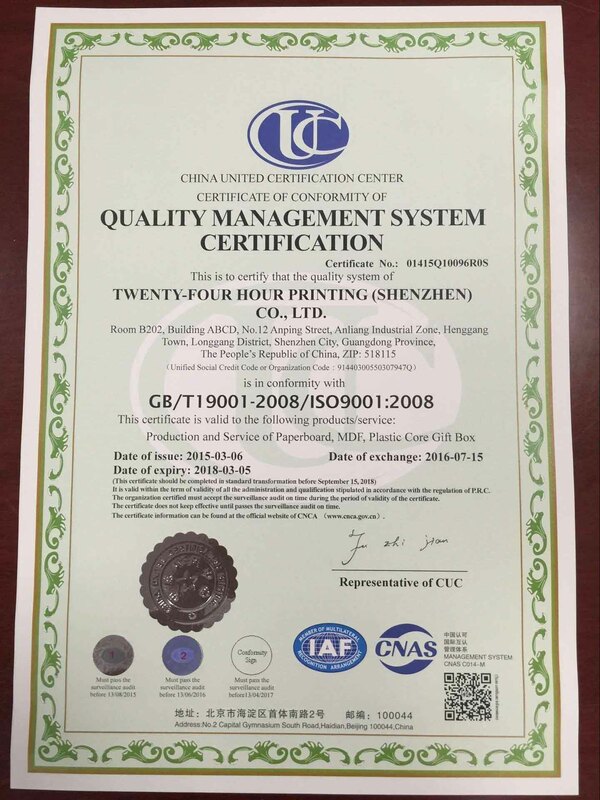 When checking the quality, we strictly follow the quality control process and customers' requirements. You are warmly welcomed to our factory.Since the foundation, we hold the spirit of "reducing costs, ensuring quality and timely delivery" , so far, products are exported to countries in North America, Europe, Southeast Asia, Middle East and Australia, and are highly recognized by our customers. Holding the goal to satisfy every customer , 24 hour printing WELCOME any enquiries from worldwide customers, we will satisfy your need and offer you better services. Place your order with us and witness the real difference in your business!